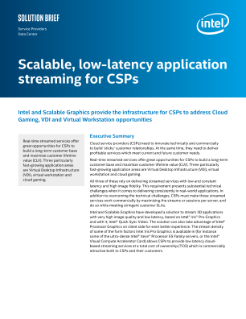 Intel and Scalable Graphics provide the infrastructure for CSPs to address Cloud Gaming, VDI, and Virtual Workstation opportunities. Cloud service providers (CSPs) need to innovate technically and commercially to build 'sticky' customer relationships. At the same time, they need to deliver profitable services which meet current and future customer ...needs. Real-time streamed services oﬀer great opportunities for CSPs to build a long-term customer base and maximize customer lifetime value (CLV). Three particularly fast-growing application areas are Virtual Desktop Infrastructure (VDI), virtual workstation and cloud gaming. All three of these rely on delivering streamed services with low and constant latency and high image fidelity. This requirement presents substantial technical challenges when it comes to delivering consistently in real-world applications. In addition to overcoming the technical challenges, CSPs must make these streamed services work commercially by maximizing the streams or sessions per server, and do so while meeting stringent customer SLAs. Intel and Scalable Graphics have developed a solution to stream 3D applications with very high image quality and low latency, based on Intel® Iris® Pro graphics and with it, Intel® Quick Sync Video. The solution can also take advantage of Intel® Processor Graphics on client side for even better experience. The stream density of some of the form factors Intel® Iris® Pro graphics is available in (for instance some of the ultra-dense Intel® Xeon® Processor E5 Family servers, or the Intel® Visual Compute Accelerator Card) allows CSPs to provide low latency cloud-based streaming services at a total cost of ownership (TCO) which is commercially attractive both to CSPs and their customers.